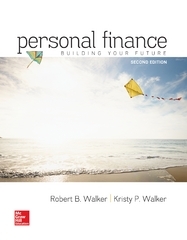 Personal Finance 1 Edition This new book offers students a comprehensive and engaging treatment of personal finance, while incorporating unique themes, an application-driven pedagogy, and a definitive action plan. Unlike other texts on the market, it offers a frank and timely discussion of living within one’s means and incorporating personal values and priorities into a personal financial plan. The intent is to help readers set priorities that guide their finances, rather than the other way around. This book establishes a path toward financial freedom that is less about accumulating wealth and more about building a future tailored to individual goals. With Walker/Walker, your future looks bright!